JACKSON, Miss. — Mississippi Attorney General Jim Hood has filed an appeal with the U.S. Supreme Court, asking that it hear its case surrounding an admitting privileges law that could close the state’s last abortion facility. As previously reported, in 2012, Mississippi legislators enacted a law requiring abortionists to have board certification and obtain hospital admitting privileges. The latter requirement, which allows abortionists to send injured women to local hospitals for further treatment, was said to serve as a safeguard to protect mothers that need critical medical care. After the bill was signed into law, Jackson Women’s Health Organization, the last abortion facility in the state, filed a lawsuit in an attempt to block the requirements. During a hearing, the facility explained in court that it had been unsuccessful in obtaining admitting privileges, and was granted six months of additional time to comply. However, none of the area hospitals agreed to partner with the facility despite the extension. “They were clear that they didn’t deal with abortion and they didn’t want the internal or the external pressure of dealing with it,” said administrator Diane Derzis. 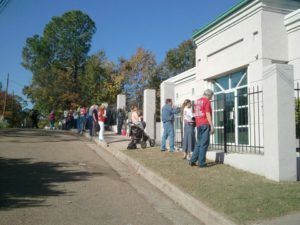 “Given that the Supreme Court long ago determined that the Constitution protects a woman’s right to choose an abortion, the ultimate issue in this appeal is whether the State of Mississippi can impose a regulation that effectively will close its only abortion clinic,” Judge E. Grady Jolly, nominated by Ronald Reagan, wrote on behalf of the majority. But Judge Emilio M. Garza wrote a dissent in which he disagreed that states are required to possess operating abortion facilities. “[N]o state is obligated to provide or guarantee the provision of abortion services within its borders,” he said. On Wednesday, Mississippi Attorney General Jim Hood appealed the matter to the U.S. Supreme Court, stating that the matter needs to be clarified by the court as the 5th Circuit Court of Appeals had upheld an identical law in Texas. “This implies that either Texas has greater authority to protect maternal health or that Texas women are somehow entitled to greater protection than Mississippi women,” the appeal stated. The owner of Jackson Women’s Health Organization, Diane Derzis, has claimed that she believes God wants her to run the abortion facility. Christian Cal Zastrow, who has shared the gospel with abortion-minded mothers outside of the facility for years, and Derzis were featured on ABC’s Nightline in 2013, as Derzis contended to reporters that God was on her side in the abortion business.